Title: Emile Durkheim: Sociologist and Philosopher Author: Dominick LaCapra Series: Critical Studies in the Humanities Imprint: The Davies Group, Publishers soft cover 314 pp. 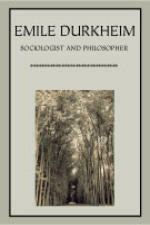 USD 24.00 ISBN 978-1888570601 September 2001 In Emile Durkheim: Sociologist and Philosopher, Dominick LaCapra, a leading theoretical historian, offers an important revised critical analysis of Durkheim’s methodological and philosophical pursuits, with an emphasis on the metaphysical, epistemological, and ethical problems inherent in forming constructs of the cultural and social spheres. [While Durkheim’s thought did not “influence significantly, if at all, the writings of Roland Barthes, Gilles Deleuze, Jacques Derrida, Michel Foucault, Julia Kristeva, Jacques Lacan, Jean-François Lyotard and other recent thinkers…the tradition he helped initiate was quite important for such figures as Pierre Bourdieu, [Marcel Mauss], Claude Lévi-Strauss, and members of the Annales school.”] In addition to presenting Durkheim as a crucial resource for current theoretical sociologists, LaCapra’s revised study situates Durkheim’s major writings in relation to the current poststructuralist critiques of one of his central issues, “the role of reason in life and its relation to normative limits and the sentiment of solidarity among members of society.” Emile Durkheim: Sociologist and Philosopher is a theoretically charged reexamination of the historical and intellectual contexts that gave rise to a unique method of philosophical sociology, providing readers from a wide range of interests with an important critical reappraisal of Durkheim’s life and writings. “While I have revised certain formulations, added material, and updated a number of footnotes, I have retained much that appeared in the original edition of this, my first book. Still, there are times when supplementary statements and seemingly small changes of inflection may significantly transform meanings. In any case, I would maintain that the issues raised in the book still preoccupy us, especially on the level of basic or background assumptions. Perhaps the key ethical and political issue in this respect is the actual and desirable interaction between legitimate limits and excessive overtures or transgressive initiatives — a recurrent issue that must always be further differentiated with respect to different sociohistorical contexts and groups. This is a crucial issue in the relation between structuralism and poststructuralism, and it calls not for an either/or decision but for an analysis of complex relations and difficult choices in particular circumstances.” — Dominick LaCapra Contents Foreword Preface, 2001 1. Introduction 2. Durkheim’s Milieu 3. The Division of Social Labor: Quo Vadis; Mechanical and Organic Solidarity; Conscience Collective; Crime and Punishment; Traditional Differentiation; Theory of Change; Residual Doubts; Contract and Solidarity; Modern Social Pathology 4. Suicide and Solidarity: The Object and Limitations of Suicide; Anomie and Egoism; Altruism and Fatalism; Durkheim and Weber; From Analysis to Reform 5. Theory and Practice: Sociology, History, and Reform; Corporatism; The Individual and Society 6. The Sacred and Society: The Theory of Religion; Sociology and Epistemology; Social Metaphysic Epilogue Selected Bibliography Index Author Jonathan Culler is Class of 1916 Professor of English and Comparative Literature at Cornell University. Among his many prestigious publications are Structuralist Poetics; On Deconstruction: Theory and Criticism after Structuralism; The Literary in Theory; and Literary Theory: A Very Short Introduction, which has been translated into more than 20 languages.